USB Safeguard is a portable software program to encrypt and protect data with a password on your removable pen drives using the AES 256 bits encryption. The main purpose of using a USB pen drive is that you can bring your data with you wherever you go. But if you lose your USB pen drive your data also lose. This is dangerous if you have confidential files stored in it. 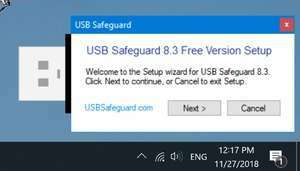 For security reasons, you should also check out the USB Safeguard Free download at LO4D.com which includes virus and malware tests. Additional screenshots of this application download may be available, too. USB Safeguard Free has a presence on social networks.